Must-have official items for every Saniwa that make Touken Ranbu even more fun! The Part 2 companion book to our Touken Ranbu Kenran Zuroku, a comprehensive official visual guide to the Touken Danshi featured in PC browser and smartphone game "Touken Ranbu," Touken Ranbu Kenran Zuroku II is coming out in summer 2018! And at the Nitroplus Online Store, we're offering the "Touken Ranbu Kenran Zuroku II" bundled together with the "Touken Ranbu: Index Stickers" as our Touken Ranbu: Summer 2018 Comiket Set! Will include a total of 26 different Touken Danshi, including Nansen Ichimonji who was introduced in April 2018. Contains images of the Touken Danshi poised for battle and illustrations by Uchiban, as well as a collection of the special-move illustrations rarely seen even in-game. But that’s not all, it’s packed full of all-new incredibly detailed images that have never been seen before! Index Stickers, printed with 72 total Touken Danshi, including Nansen Ichimonji, added in April 2018. Features one horizontal and one vertical design for each character, with a total of 160 stickers to use however you like. Stickers are made of paper, enabling you to add text with pen or pencil. 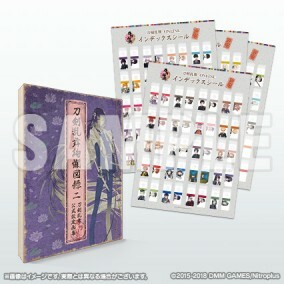 Perfect for your planner, notebook, or Touken Ranbu Kenran Zuroku II! ・This product will be available for advanced sale at Comic Market 94, held Aug. 10-12, 2018 at Tokyo Big Site. Please note that your order cannot be cancelled. ・There are plans to offer both the "Touken Ranbu Kenran Zuroku II" and the "Touken Ranbu: Index Stickers" for sale individually at a later date, but no further information is available at this time. Individual sale prices are listed below. ・Please refrain from contacting the Nitroplus Store regarding Comic Market 94 inquiries. * All orders received during these dates will be honored. * In the event that pre-order reservations exceed available supply, acceptance of new orders may be temporarily suspended. Scheduled to ship from (Fri) Aug. 31, 2018. Should unforeseen circumstances cause shipment delay, we ask for your patience and understanding. Frist available at Comic Market 94.